Saint Benedict ‘s parish, stems from a mission from St. Mary’s in 1854. During those years, having only one parish in the Newark area, German settlers in East Newark found it difficult to attend church. The decision to build a new church in the Neck area of Newark was widely supported. Under the title of “Saint Joseph’s Church,” the people erected a two-story structure, consisting of brick for the first floor, and frame for the second story. The lower part was to serve as a school and the upper as a church. In the following years, mass was held only occasionally and eventually this parish was lost in midst of newly erected parishes, one of which was also named St. Joseph’s Church. Prominent members of the congregation were convinced that the original members of the parish would surely return and remain faithful to their religious duties. Father Oswald reported the matter to the Bishop of Newark, the Most Reverend James Roosevelt Bayley, who was very much pleased to hear that the congregation was being revived. 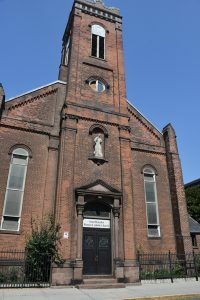 Partly because there was now another Saint Joseph’s Church in Newark, and partly because of the warm interest of the spiritual sons of Saint Benedict in the congregation, Bishop Bayley chose Saint Benedict as the Patron Saint of the downtown church.